I was super excited to see a good friend start up a little Love Wins quilt bee online recently, and naturally, I jumped at the chance to make a block for the quilt. Our bee is full, but if you feel inspired to start one, gather your troops! Pull together some friends, or reach out via social media, and get your own group started! I toyed with a couple of much beloved blocks for my Love Wins block, but ultimately, I decided I wanted to start something new. A new star, natch :) And here is what I came up with - the Love Wins Star. This star will be a new pattern of mine before the month is through, and I'm excited at the possibilities with this one. It is intricate, as are most paper-pieced stars, but the pieces come together quite quickly, and the results are pretty awesome. In the latest issue of Love Patchwork & Quilting, issue #20, starting to hit newsstands in England, you'll find another fun mini quilt pattern from yours truly. This is one of my personal favorites! The Rainbow Geese mini pattern is a great foundation paper piecing pattern that features beautifully vibrant rainbow solids, mixed with some grayscale solids to make the rainbow colors pop. One of my most favorite color palettes to use is a good old-fashioned rainbow. It never fails to put a smile on my face! This mini is destined to hang up in my new sewing space in my new house when it returns home soon, where many of the other minis in this series have been hung so far. I'm nearing the end of my setup process, and promise to share pictures soon. I'm excited to finish and to share, it's a great space. I've got great natural light from a large window in the room and a super fun, under-the-stairs closet that's perfect for stowing tons of stuff! It's no secret that I adore working with solids, so when I found out that Kona was celebrating their 30th birthday, I wanted in on the fun! I love the crisp, graphic look at that solids bring to any project, and Kona has the largest selection of colors so I'm often sewing with Kona solids! Today is my stop on the Kona 30 blog hop, in which thirty fabulously talented designers are sharing the fantastic quilts that they've sewn up to honor Kona and their 303 amazing shades. The quilt I've created for Kona's big birthday is my Eternity Ring quilt and pattern! For my contribution, I created a new pattern which I'm calling Eternity Ring. I wanted to play around with the idea of a paper pieced wedding ring quilt, as curves and I have yet to really play nice with one another. 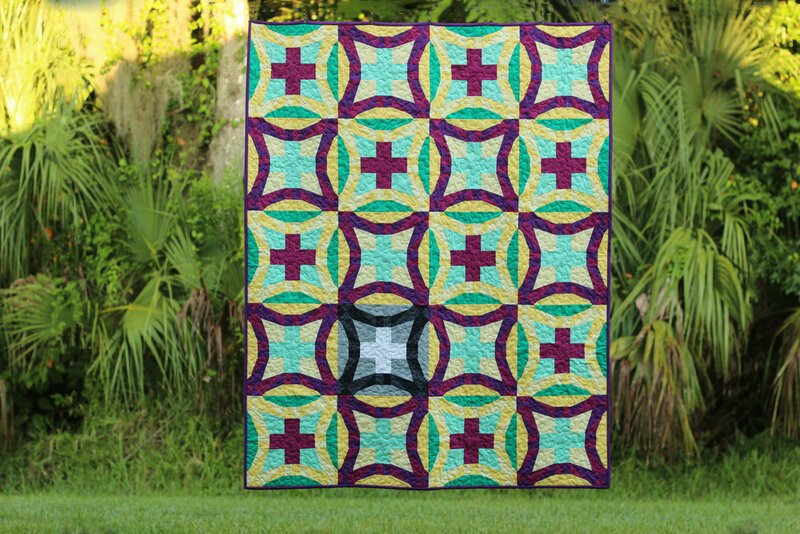 My Eternity Ring quilt is sewn up in gorgeous, rich Kona solids in shades of emerald and fuchsia, with one singular block sewn together in grayscale. I love the contrast the one gray block brings to the whole quilt. I pulled some of my favorite shades of Kona, like Kona Pond (quite possibly my all-time-favorite Kona solid), Kona Cerise, Kona Iron, Kona White and Kona Black and threw in some newer favorites, Kona Kale, Kona Dark Violet, Kona Charcoal, and Kona Lemon for this beauty. The blocks alternate to create a faux double wedding ring look, which is created through four paper piecing templates, which come together to create the quarter-block units for completing the blocks. Never paper pieced before? No worries! The pattern comes with detailed instructions, accompanied by photographs to help visual learners work through the pattern. You can also take advantage of a great deal on my new Craftsy class, Start Foundation Paper Piecing, which has boatloads of tips and tricks to make paper piecing a fun, addictive experience! 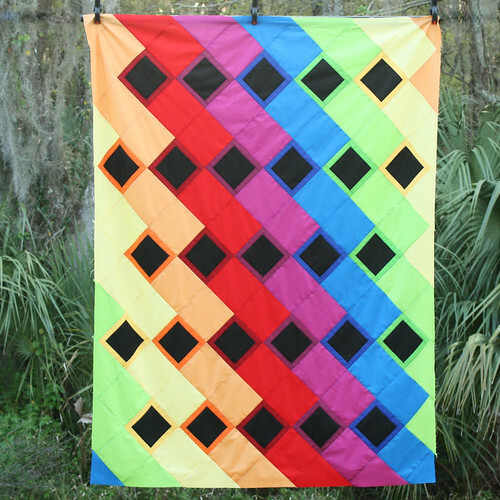 This foundation paper-pieced quilt pattern is now available through my Pattern Shop as well as through Craftsy, yay!! The pattern also includes a complete cutting list and fabric yardage instructions for four different quilt sizes: baby, lap, twin, and queen. And to celebrate the wonderful 30 Years of Kona Cotton Solids, I'm doing a little giveaway today - you can enter the Rafflecopter below to win a beautiful charm pack of the Kona Brights and a copy of my Eternity Ring pattern as well! You must enter to win by the end of the day today, November 30th, so hop to it! There's only a few more stops on the 30 Quilts for 30 Years blog hop, but there's plenty to catch up on if you haven't seen all the fabulous quilts! You can also see all 30 designs in Kaufman's 30 Quilts for 30 Years Lookbook. Check out the great collection of Kona quilts by all of these fabulous designers listed below! Looking for my Black Friday Sale? It ends tonight! Grab the coupon code right here! Oh my goodness, we're getting to the end of the calendar! The first of the month is here again, this time to ring in October. This month's Lucky Star block of the month is the Galactic Star, a supremely dimensional block with lots of attitude. This block is pieced using irregular triangle templates, which is a good bit different than the majority of the Lucky Stars blocks thus far, but not to worry - it's definitely not rocket science :) In fact, I think you'll really enjoy the simplicity of this block and the different looks you can create! Don't forget to tag your photos if you share them on Instagram or Facebook with #luckystarsbom so I can see what you create! As always, you can join in the block of the month club at any time by visiting my Pattern Shop, and you won't miss a single pattern from the series! Psst - Make sure to scroll down to the bottom of this post for a great giveaway!! There's nothing like a cheery fabric rainbow to make you smile, am I right? I had a lot of fun cutting into these solids and sewing them together. I've used a lot of different solids since I've been quilting, ranging from rough fabrics that are nearly impossible to press to super smooth almost silky solids, and the RJR Cotton Supreme Solids are a good middle grade solid - not so smooth that they're slippery but not rough and sandpaper-y either. They're quite soft and drape nicely, and they don't require loads of Best Press to get the wrinkles out. They press quite nicely and I enjoyed working them, and sewing up them up into quilt top. 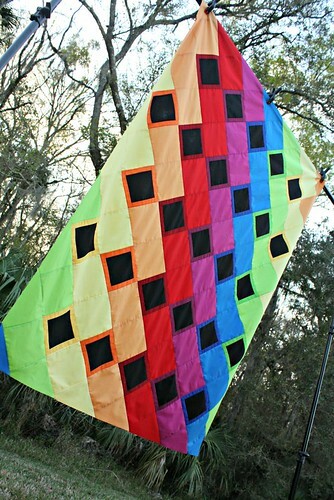 I'm calling it the Rainbow Dance Party quilt, thanks to some valuable feedback from a friend. How fun is this top?! I'm really looking forward to quilting it up, using a bunch of coordinating Aurifil threads. I'm just waiting for my orange to arrive and then I'll be getting started on the quilting. You can find many of these colors in stock at Pink Castle Fabrics. Do you love a good fabric rainbow too? Then you're in luck, because RJR is generously giving away a bundle of these fabrics to one lucky reader. All you need to do is enter the Rafflecopter giveaway below! Tell me about an all solids quilt you've sewn up, and if you haven't sewn up a solids quilt before, tell me why. This giveaway will end next Thursday, March 6th, at 11:59 PM, and a winner will be announced on Friday, March 7th.